One day not long ago, I asked our orchid growing friends what it was, exactly, that made orchids– these unique plants with such strange flowers– so alluring, so nearly impossible to resist. The answer, in so many words, always boiled down to this: tending orchids linked each one of us to what was mysterious, beautiful, and profoundly awe-inspiring on this planet in a way that nothing else could. Orchids wind up demanding to surround you. They demand your passion for life. In return, they will reward you with sublime beauty, and, if you’re attentive, orchids will transport you to distant and mysterious shores. We want you to visit those shores with us. And we created the OrchidTalk Orchid Forums to ensure that your journeys leave you surprised and filled with joy. Take your time here to browse our orchid site, explore the Orchid Forum where orchids are the main topic of conversation and you can chat with growers from all over the world. While you are here, be sure to pick up some repotting and growing tips in our orchid care section. We are strong supporting members of the Sierra Club, and make it our goal to help conserve the natural resources that make orchids possible in the first place. 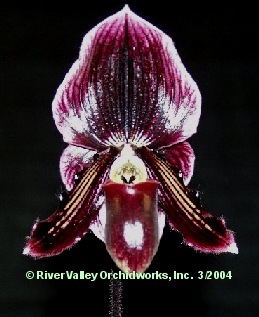 After growing orchids for over sixteen years and tending quantities of orchid plants, Louis and Bruce decided to team up and create RVO, River Valley Orchidworks, an orchid community and virtual home on the web where they can share and trade knowledge with folks who grow orchids from all over the planet. 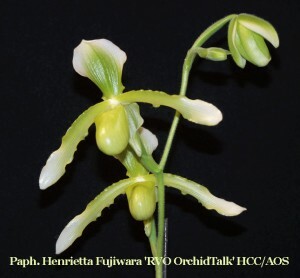 This prompted the creation of the OrchidTalk Orchid Forum where they have given a place for new growers to advanced growers to come together and discuss orchid growing and cultivation. Their nursery is located behind their home in Clarksville, Arkansas. In the forums, you will see many photos of their beautiful orchid blooms and plants. 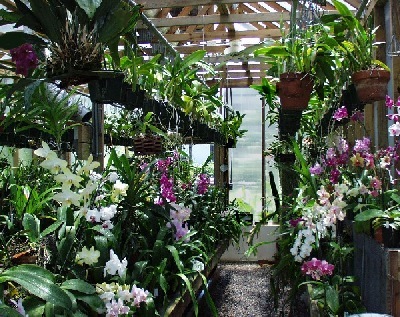 They welcome visits from the OrchidTalk orchid forum members, but ask that you make an appointment before stopping by. Bruce served as the Walton Professor of Theatre at University of the Ozarks in Clarksville AR for 22 years where he spent many of his spare hours furthering the education and growth of his students by encouraging their exploration of different design philosophies and world travel. He maintains the OrchidTalk Orchid Forum and is a past President for his orchid society in Rogers, Arkansas. Louis has his Masters in Counseling and is a certified rehabilitation counselor. He is currently the Clinical Director of Counseling Associates, Inc. here in Clarksville. On occasion, he writes short horror and science fiction for publication. When hectic schedules and business permit, they both love to explore and travel.